Medical Supplies & Medical Equipment Information: How stable are surgical instrument trays on stands? How stable are surgical instrument trays on stands? Stands to hold surgical instrument trays come in a variety of styles and designs based on the type of situation in which they will be used. There are some that are standard four leg types of stands that have wired guards or flat surfaces to allow staff to place the surgical instrument trays on the stand when needed. Other options include the pedestal style or the two leg or post stands that are often used to position the stand over the patient in a surgical procedure. The 2 post or single pedestal stands are designed with braces or legs that extend from the crossbar at the bottom forward in a horizontal fashion. This ensures that the weight on the tray will not tip the stand forward since there is no physical support under the tray. As these stands are typically made of stainless steel tubing they are very strong and durable, designed to remain upright and not tip even with considerable weight applied to the tray area. What sizes do surgical instrument trays with and without covers typically come in? There are many different sizes and styles of surgical instrument trays available. The covered trays typically are larger and heavier than the standard drying or perforated trays. A covered tray is typically 12.74inches by 7.75 inches in length and width, with the height of the tray without the cover being 2.25 inches. 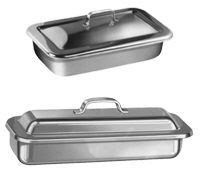 The cover, depending on the style and handle type can add another inch or more to the overall height when the cover is on the tray. Perforated instrument trays can range from 10 inches by 6.5 by 2 inches to larger sizes of 16.5 inches by 10inches by 2.5 inches. Flat drying trays come in the same height and width ranges as perforated trays but are typically shorter, often .75 to 1.25 inches in height on the rolled edges. Smaller trays measuring approximately 8.8 inches by 5 inches by 2 inches are also available if required. What are magnetic instrument trays and how are they used? In surgical settings magnetic instrument trays are a very easy, simple and disposable way to keep metal instruments in the right place and within easy access for the surgeon. These trays, which are actually cloth drapes with magnetic sections, are fully disposable. Most come in a standard size of 9.5 by 15.5 inches or 19.5 by 15.5 inches, perfect for laying across the patient during the surgical procedure. They can also be used as a substitute for larger surgical trays and stands if only a few instruments are required for the procedure. The metal instruments will immediately attach to the magnets in the drape, keeping them in place and very immediately accessible to the surgeon and assisting nurses and staff. They are also ideal for minor surgeries and treatments that are completed right in the doctor's office. The size of the tray or drape means it can be placed longitudinally or across the patient depending on the specific procedure and location of the trauma or area being treated.